The Museum Garden at Gaasbeek (2,5ha) dates from 1996-1997 and is situated in the ancient Gaasbeek estate on the South slopes of Brussels. 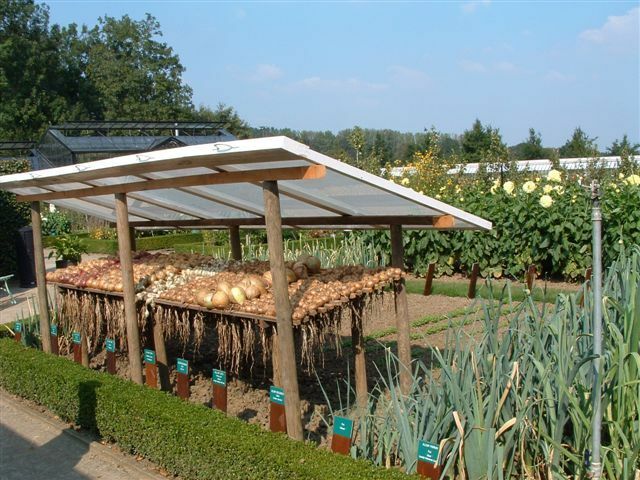 The different sections of the garden show the Flemish art of gardening from 1860 till 1940 by trying to preserve and pass on the traditional horticultural skills from the past. The Museum Garden harbours a fine selection of hard and small fruit, vegetables, ornamental perennials and conservatory plants and climbing roses dating from around 1900. It was nearly doubled in surface in 2005. The extension shows a display of the most important modern pruning methods for low standard fruit. During the 16th century, the estate was owned by the Egmond family, of whom Lamoral count of Egmond (°1522-1569), famous defender of the religious freedom, was beheaded in 1569 together with his dear friend and conspirator Philip de Montmorency, count of Horn (°1518) at the Grote Markt in Brussels by order of the Spanish catholic king Philip II. The terrace garden dates from the René de Renesse de Warfusée period and was made between 1615 and 1633. The terrace garden is part of the Museum Garden lay out. First of all there is the terrace garden area with a splendid early 17th century carrara marble fountain. The original 17th high south facing garden wall hosts a collection of perfectly fan trained apricot, peach and nectarine trees. The upper terrace with its 19th century quarter-circled grape house, leaning against the east wall, hosts a selection of conservatory trees in tubs: figs, coffee plants, tangerines, lemons, oranges, litchees and many more. The central long axe of the terrace gardens continues through the second division of the Museum Garden, the walled vegetable and hard fruit garden. 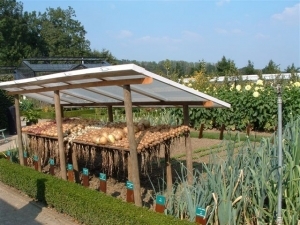 Here we find the great conservatory (2000) with left and right the cold frames. 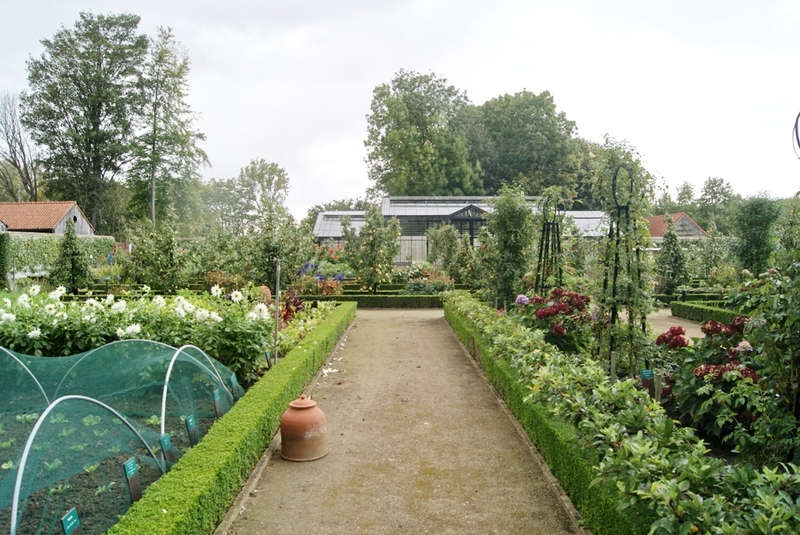 The four quarters with the vegetables and dahlia’s are aligned by beds, which are planted with ornamental perennials and, winged pyramid apple trees along the main axe and climbing roses and herbs along the short axe. The garden walls are covered with an outstanding collection of apple and pear trees, all trained in different 19th century forms starting from the palmet verrier type over the target shaped type to the double U-type. Here some apples and pears are ‘sacked’ of ‘bagged’ during the ripening process to produce fruit to perfection: extra big, sweet and of superior quality. William Bon Chrétien pears are grow in bottles to produce the famous Poire Williams. The next garden is de walled small fruit and nut garden with a collection of small fruit shrubs (blackberries, raspberries, gooseberries, red, white and black currants) in their traditional training forms, a selection of hardy grapes, kiwi and passion flower on north side; almonds and hazelnuts on the south side. The white painted walls are covered here with more unusual but traditional forms of trained fruit trees, some of them being apples. The garden at the north side contains a cruciform bower with a fruit hedge. The south garden contains de Belgian reference collection of Draps’ hydrangeas and fan shaped ‘Schaarbeekse krieken’, being the famous sour cherries that give their delicate aroma to the local cherry beer. Against a trellis along the central axe stands a collection of horizontally trained prunes and gages. Further on the central axe lays the half-standard prune and gage orchard with over 70 varieties. Up to 1940 half-standard prune orchards where very common in this part of Belgium, where small stock grazed under the supervision of the farmer’s wife. They’ve all disappeared. The half-standard orchard in the Museum Garden has a 2m high hornbeam hedge. More to the west and parallel with these gardens we find from this year on a set of 3 more garden divisions with the same display. At the end of the long axe there is the mixed high-standard orchard with the same surface as the half-standard prune orchard. This orchard harbours a selection of traditional cooking. Please contact: Agentschap voor Natuur en Bos, Waaistraat 1 – 3000 Leuven (tel. +32 (0)16 21 12 26 during office hours). The castle is open each day, except Monday, from the beginning of April until the end of November. Entrance fee to the castle is about 12,00 Euro (during exhibitions) for individuals. See www.kasteelvangaasbeek.be for special tariffs and details. See website www.kasteelvangaasbeek.be for details.